Tomorrow is my favorite day of the year at GLIDE. After several weeks in which thousands of toys have been collected, tomorrow dozens of volunteers—led by one amazing TOY LADY, longtime GLIDE church member Laurie Ferreira—will pass out nearly 2,000 bags of toys to children in need during GLIDE’s extraordinary annual Toy Giveaway. Kids and their parents start lining up in the wee hours of the morning in anticipation of entering a super-sized Santa’s workshop in GLIDE’s Freedom Hall, filled with a veritable mountain of bright holiday bags containing a range of carefully sorted age-appropriate gifts for everyone from toddlers to teens. An effort this large requires thousands of church members and community and corporate partners. 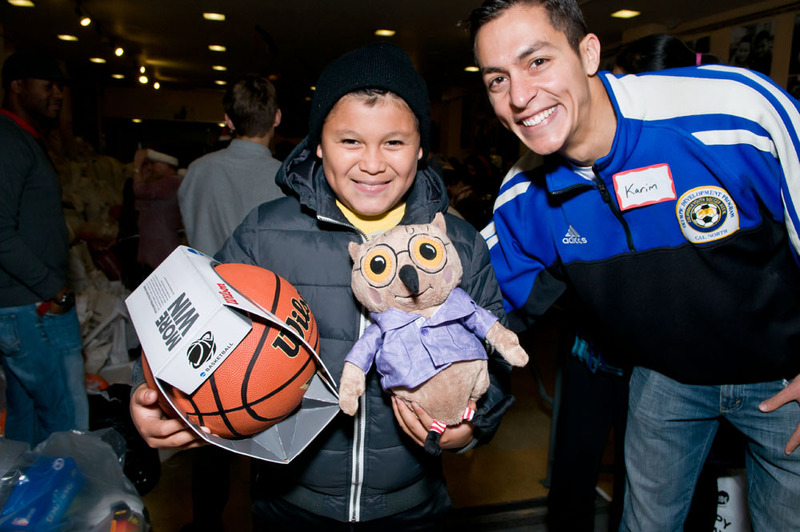 Weekly announcements at GLIDE’s Sunday Celebrations resulted in a hugely successful toy drive this year, and several new and longtime corporate partners have stepped up to increase attention and involvement in this special event. Macy’s has generously sponsored this year, underwriting the cost of the event and hosting toy drives at its Union Square and Stonestown stores as well as at the local headquarters of Macys.com. In addition to collecting toys, dozens of Macy’s volunteers have helped sort them for the kids and will join other volunteer groups tomorrow morning for the Main Event. The Toy Giveaway sponsorship is yet another way the company, known for its giant Union Square Christmas tree and its festive holiday window displays, celebrates this season of giving. Other key partners in this herculean effort include our amazing Legacy Committee (GLIDE’s young professionals group), The Battery SF, Demandforce, Dolby, Price Waterhouse Coopers, Umpqua Bank, Yelp, Virgin America, Wells Fargo, Munchery and Wharton SF. The Battery and Demandforce, for example, shared their ingenuity and resources by creating an Amazon Toy Wish List and encouraging members and employees to shop generously. Their efforts resulted in nearly 1,000 new toys being purchased and delivered. Santa needs a lot of helpers. Before the big day, all the collected toys are transferred to St. Mary’s Cathedral, just up the hill from GLIDE, where some 60 volunteers gathered every night this week in a giant room to thoughtfully sort thousands of toys by age and gender and ultimately pack them into individual bags for distribution. Today, Friday, more volunteers engineer the Great Toy Move from St. Mary’s back to GLIDE, where bags of toys are displayed and holiday decorations provide the final touches. Upon entering Freedom Hall at GLIDE tomorrow, excited children are paired with a friendly, eager volunteer who acts as a guide, allowing each child to choose and receive just the right gift without parental pressure or direction. Holiday music plays in the air, shouts of joy and laughter fill the room and the magic of the season comes to life in a beautiful morning of giving.